The 4th Playing Colloidal Mikado Workshop on the topic of rod-like LC in equilibrium and out-of equilibrium will be held at CNRS, Bordeaux, from 16-17 November 2016 under the auspices of DiStruc. The three previous workshops were held in Oxford (2009), Luxembourg (2010), and Eindhoven (2016). The workshops aim to bring together active researchers interested in the area of colloidal rods to discuss current research, results, and problems of experimental, theoretical and computational aspects. We look forward to an exciting workshop and to seeing you in Bordeaux. Invited Speakers include Zvonimir Dogic, Jacques Prost, Samuel Poincloux, Tanja Schilling, Thomas Gibaud. Thomas Gibaud, CNRS, Ecole Normale Supérieure de Lyon. Samuel Poincloux, Laboratoire de Physique Statistique, Ecole Normale Supérieure. Jacques Prost, CNRS, Institut Curie. Tanja Schilling, University of Luxembourg. The 4th Playing Colloidal Mikado will take place at the Centre de Recherche Paul Pascal (CRPP) in Bordeaux, France. CRPP is situated in the campus of the University of Bordeaux, approximately 7 km from the historical city centre. 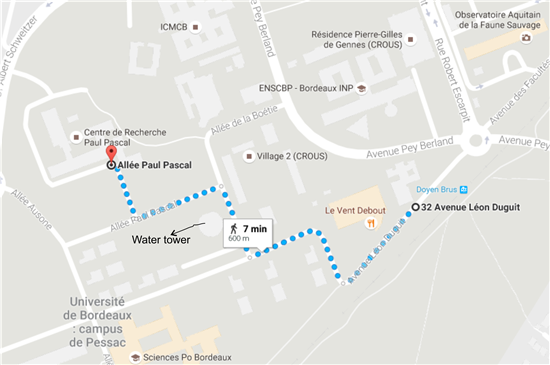 You can access the campus using the Tram line B (direction Mérignac Centre). CRPP is a 5 minute walk from stop Doyen Brus. (See the map below.) The travel time from the city centre should be around 25 minutes. More information on the Tram and other public transport in Bordeaux can be found here. Registration for the 4th Playing Colloidal Mikado workshop is OPEN until Monday 7 November 2016. To register please visit the Oxford University Online Store. Fees are paid by card only. If your card is issued in a country whose currency is Euros (or any other major currency) then when you get to the checkout, you will be offered the option of paying in GBP or your local currency, using the rate that is in force at the time. Unfortunately this will vary from day to day. Includes attendance to the event, coffee breaks, Mikado dinner on 16th November, lunch on 17th November. * The DiStruc fellows and the invited speakers do not need to register.